By the time you read this, most of us here at FHM might still be suffering from a little hangover, from last night’s FHM X Anniversary Bash. Some of you reading this might be experiencing the same. [firstpara] Fortunately for the others (or is that, unfortunately?) 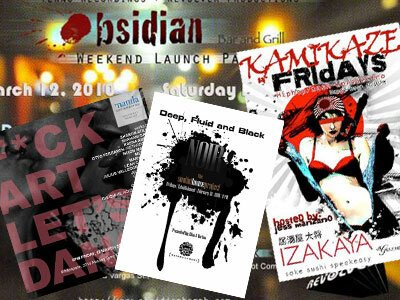 there are a lot of places to get wasted at, this coming weekend. Happening over at the Manila Contemporary, Whitespace is the quirkily titled event F*CK ART, LET’S DANCE. What is this event exactly? Is it an art exhibit that aims to get some attention with its ironic title? Or is it a really just a dance party that wants you to make love (hence, f*ck) to some beautiful art? Well, it is both. Featuring the works of Sharon Atillo, Shahani Gania, Raena Abella, Otto Ferraren (Retardo Art), Nixon Marquez, Merryloo, Marvin Tojos, Leah Castaneda, Julius Valledor (BEE EYES), Jujin Samonte, Chris Yniguez, Chi Kotur, Cameron Clark and CHI CHI (Blackbook Design/KST), the event plays host to some delicious artwork, that’s sure to fill the appetite of any art lover. There will be performances from BEE EYES, Taken by Cars, Pedicab as well as DJ sets by Gigee, Chie Castaneda and The Diegos. The launch event happens tonight, March 12, 6 PM but the artwork will be on exhibit until March 19. On January 12, The Jerks will be playing their usual set at 70s Bistro. A bigger lineup of bands will be making an appearance at Mag:net Katipunan, including Chubibo, The Brew, Shuteyeview, Smoke My Cuban and Ten Story Fall.